The puzzling - and thus far indecipherable - nature of an old manuscript has confounded some of the world's greatest cryptologists. Is there truly a code to break, or is it all an elaborate hoax? I have come to the Beinecke Rare Book and Manuscript Library, at Yale University, to solve a mystery that makes The Da Vinci Code seem tame - a book no-one can read, in a language that doesn't exist, illustrated with plants and creatures that have never been seen on Earth. It is known as The Voynich Manuscript, after the second-hand book dealer, Wilfrid Voynich, who claimed to have discovered it in Italy, in 1912. Since then, it has obsessed countless experts and generated numerous theories, both scientific and crackpot. "My favourite is that it is the illustrated diary of a teenage space alien who left it behind on earth," jokes the Beinecke's curator, Ray Clemens. What surprises me is how small it is. I had expected an album-sized manuscript. But the book resting on a reading stand in front of me is about the size of a Penguin Classics edition. Bound in a limp vellum cover the colour of old ivory, it contains 240 richly illustrated pages. The illustrations look like something Timothy Leary might have seen on LSD. Strange plants, astrological symbols, jellyfish-like creatures and what looks like a lobster. In one image, a group of naked ladies with alabaster skin shoot down what looks like a water slide. The text, written in brown, iron gall ink, reminds me of Tolkien's Elvish. Image caption These two sections appear to show naked women bathing - or perhaps on a water slide? Some facts. Voynich was an ethnic Pole from Lithuania, in what was then the Russian Empire. Born in 1865, he was briefly imprisoned in Siberia for revolutionary activities before fleeing via Manchuria to London. In London, he set up a second-hand bookstore, which became a centre for political exiles. Among them were Karl Marx and a Russian emigre, who adopted the moniker Sidney Reilly and became known to posterity as "The Ace of Spies". Voynich claimed to have stumbled on the manuscript at a Jesuit seminary outside Rome, The Villa Madragone. Appended to the manuscript was what purported to be a letter written in 1665 by Johannes Marcus Marci, a former physician of the Holy Roman Emperor. It stated that the manuscript had once belonged to Rudolf - and was probably the work of Elizabethan alchemist Roger Bacon. Two other possible authors are regularly in the frame: John Dee, magus extraordinaire and astrologer to Queen Elizabeth I, and Dee's fellow alchemist, Edward Kelley. Voynich himself referred to it as "The Roger Bacon Cipher Manuscript". Image caption Wilfrid Voynich - discoverer of the rare manuscript or skilled forger? Since then, it has been a Venus flytrap for brilliant minds. American William Friedman, one of the greatest cryptographers of the 20th Century, who created an institution recently made famous by Edward Snowden, the NSA, spent 30 years trying to crack the manuscript's code. New theories breed like mayflies. A retired American botanist recently claimed that some of the plants are of Meso-American origin. A British applied linguist claims to have translated 10 words. Image caption Sidney Reilly, "The Ace of Spies"
So what is it? A cipher for buried treasure? A poisoner's handbook? The coded recipe for eternal youth? 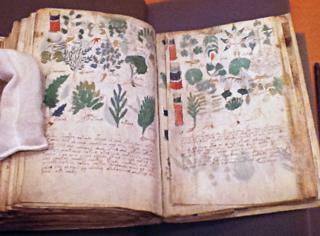 Spoiler alert: I believe the manuscript is a forgery by Wilfrid Voynich himself. One of the most common tropes in the history of forgery is that of a rare book dealer "discovering" previously unknown manuscripts. Voynich is known to have had just this "magic" touch. He is also said to have acquired a large supply of vellum and to have used his knowledge of chemistry gained at the University of Moscow to replicate medieval inks and pigments. Readers' tickets for his shadowy friend, Sidney Reilly, show that among the books that the "Ace of Spies" studied at the British Museum library was Some Observations On Ancient Inks. I believe that having forged the manuscript, Voynich then did what numerous other forgers have done - create a second document to validate the first and give it a plausible provenance. But until forensic tests are done on the ink and pigments - so far, only the vellum has been carbon dated to the 15th Century - the riddle of this mysterious book will continue to exert a powerful magnetic pull on present and future Voynichologists. "To its deciphering he devoted unflagging toil," Marci wrote of the previous owner, in the letter Voynich claimed to have found in the manuscript. "As is apparent from attempts of his which I send you herewith, and he relinquished hope only with his life." From Our Own Correspondent: Listen online or download the podcast.